A bill under consideration at the statehouse would set new insurance guidelines for Uber and Lyft drivers and the ride-sharing companies. Representative Dawn Pettengill, a Republican from Mount Auburn, says it’s about safety and peace of mind. “It will be more transparent to the drivers and the passengers can make sure that there’s adequate coverage,” Pettengill says. The companies use smart phone apps to connect drivers who use their personal vehicles to give rides to paying passengers. Scott Weiser is a lobbyist for “Trans Iowa” which bills itself as the state’s oldest and largest cab service. “We want to ensure that my cab companies and others can be competitive with an unregulated industry,” Weiser says. 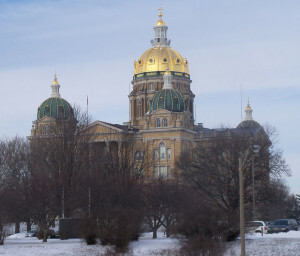 Trans Iowa operates Yellow Cabs and Capitol Cabs in central Iowa. A more wide-ranging bill to establish statewide standards for ride-sharing companies failed to pass the legislature last year. Some Iowa cities have passed local ordinances to regulate the ride-sharing industry.